Ken Lussey is the author of Eyes Turned Skywards, a thriller set in Scotland in World War Two. It takes as its starting point the mystery that surrounds the real-world air crash in Caithness in 1942 that killed the Duke of Kent, brother of King George VI, and weaves around it a fictional web of intrigue and deceit. Ken Lussey spent his first 17 years following his family – his father was a Royal Air Force navigator – around the world, a process that involved seven schools and a dozen different postal addresses. He went to Hull University in 1975, spending his time there meeting his wife Maureen, hitch-hiking around Great Britain, and doing just enough actual work to gain a reasonable degree in that most useful of subjects, philosophy. The next step seemed obvious. He researched and wrote 'A Hitch-Hiker's Guide to Great Britain', which was published by Penguin Books in 1983. An inexplicable regression into conformity saw him become a civil servant for the next couple of decades, during which time he fulfilled the long-held ambition of moving to Scotland. In more recent times he has helped Maureen establish the website ‘Undiscovered Scotland’ as the ultimate online guide to Scotland. ‘Eyes Turned Skywards’ is his first novel. 'Eyes Turned Skywards' is a thriller set in Scotland in World War Two and was published by Fledgling Press on 31 May 2018. It is available from larger bookshops in Scotland, as well as on order from others, or via online retailers such as Amazon. You can find out much more about 'Eyes Turned Skywards' on my page about the book, which gives a fuller synposis and links to background information and articles, reviews, and a radio interview. Or you can read about and view photographs of the locations used in the book on this page. 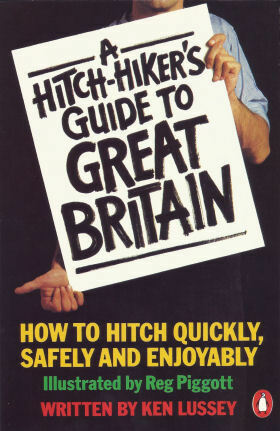 'A Hitch-Hiker's Guide to Great Britain' was published by Penguin Books on 26 May 1983. I am rather amazed to be able to report that second-hand copies are still available on Amazon. After all this time it should probably be regarded as more of historical interest than practical value. When 'Eyes Turned Skywards' was published, 35 years and 5 days after 'A Hitch-Hiker's Guide to Great Britain', I did wonder whether it might be some sort of record for the gap between first and seecond books by an author. Not a chance. It took Harper Lee 55 years to publish her second book, and there are a few other very long gaps too. You can get in touch with me via email or Twitter. Details are set out on the right.